yeah! Won them on Facebook. I have no idea where they are but they're free so who cares. It should be a good game since Columbus is up 2-0! I hope you have a great time, and I hope even more (as a Tampa fan) that you get to see the Blue Bellies lose! haha. If your Lightning go down 3 games to none it's most likely over for them! They tied the NHL record for most wins and were the Presidents trophy winner for most points this season while the Blue Jackets had to scramble just to make the playoffs. As they say, anything can happen in the Quest for Lord Stanley's Cup. Old time hockey, eh? Toe Blake! Eddie Shore! NHL playoffs are always fun. Even with the Hawks watching from their own living rooms and me having no clear back-up favorite, it's still a lot of fun. Maybe because I don't have a favorite at this point, that might make it better because there's no angst? Keep a wet edge, bro! 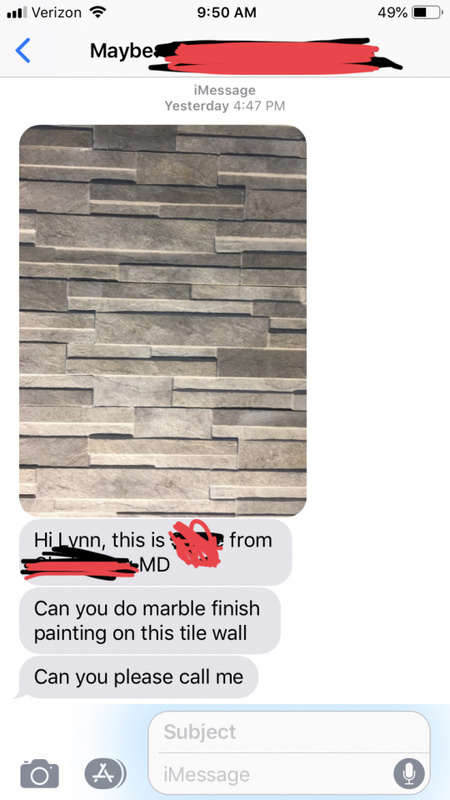 I sent a quote to this person a month ago to marbelize an accent wall to look like Carrara. She thought I was too expensive. So, is this the same woman asking you to do different work, or asking you to do the same job, not realizing you already have her a price? I quoted the price for faux Carrara on a 10x20 wall. She said she’d get back to me, but I had a feeling my price was too expensive. She had someone else apply that random tile to same wall. That message was sent the night before the quote expired. I did end up calling her because she texted me 10 times. She just said she hates it so much that she wants me to paint over it, to which I said no, not a good idea. She ended up continuing to text and call me,she consulted the tile guys on how I can paint over it. I ended up giving her a price that was three times what my original quote was. She said that was very expensive and she’ll get back to me. Pete Martin the Painter likes this. The playoffs were always a battle to the finish, especially in the old days when it was legal to do almost anything on the ice when Hawks like Max Bentley, Mush Marsh, Bill Mosienko, Johnny Gottselig, Earl Siebert and Chuck Gardiner wore the Indian Head Sweater! It's called I can't make up my mind. Too many people are afflicted with this disorder, unfortunately. Those guys are before my time! Mush Marsh is an awesome name though! Damn! The days before goalie masks and helmets was insane! And I bet they did it for next to nothing too. Read the other day that Hall Of Famer Ernie Banks made $800,000 TOTAL in his career. And hockey being a much smaller sport then had to be worse even for the greats. But, still the only sport with a dental plan!